Training for and completing a Half Marathon (13.1M) is a challenging and rewarding endeavor. Participants in our 12-week program benefit from our professional head coaches, experienced mentors, and managed group workouts on the St. Louis area’s best paths, as well as access to an extensive lineup of health care professionals and informational clinics on nutrition, hydration, gear, injury prevention, stretching techniques, and more. Additional perks are available for those who choose to fundraise for St. Jude Children's Hospital. Our Standard program is appropriate for anyone who wants to enjoy training to run or walk 13.1 miles between 1½ hours (8:00/mile long run training pace) and 3½ hours (17:00/mile long walk training pace). We welcome first-time half marathoners and veterans, runners and walkers looking for a structured program that will prepare them for a personal best. Starting mileage is based on your experience level, with beginning long workouts ranging from 3 to 6 miles. 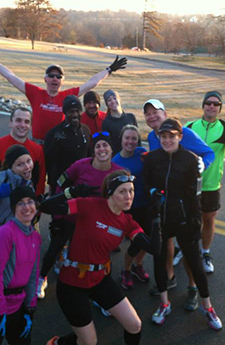 Our Advanced program is for experienced half marathoners who have made the transition from completing to competing. Program applicants are first assessed by our professional coaches and - if they have the foundation needed to train to race 13.1 miles under in 2¼ hours (10:30/mile long run training pace) or faster - are accepted into this positive, driven training environment. 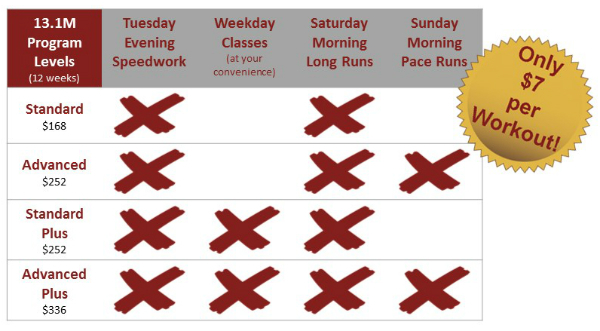 Advanced half marathoners receive the perks of the standard program plus customized schedules based on one-on-one assessments and additional group speed workouts. Starting mileage is 6 miles. Our Plus ﻿program options add a weekly Functional Strength or Functional Flexibility class to the training program. These classes help enhance performance and reduce injury risk and are important ingredients to a well-rounded training program, as explained here. Individualized training in a group setting. Our proven program has served more than 8300 half marathoners. Over the past nine years, participants have given the program an average rating of 4.8 stars (out of five) and more than 90% have completed their goal race. Our program is appropriate for both first-timers and experienced veterans. Our community is vast. We have a plethora of experience and abilities that both compete and complete the half marathon distance. Our experienced mentors offer support and motivation to athletes in pace groups ranging from 8:00/mile (run) to 17:00/mile (walk) and follow customized novice, intermediate, and advanced schedules. The program begins with a formal meeting on Saturday, January 20th, 2018 at 7:30am at the Forest Park Visitor Center. 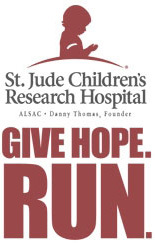 Program is geared towards any half marathon early April through early May. Take the first two steps of the Fleet Feet Training Arch and purchase the Standard Half Marathon Program for $168 and the Advanced Half Marathon Program for $252. Add 12 performance-enhancing and injury-reducing Fleet Feet group classes to complete the Fleet Feet Training Arch, pay $252 (Standard) or $336 (Advanced), and receive one weekly Functional Strength or Functional Flexibility group class. *Register before Saturday, January 13th and receive a $13.10 gift card to any of our five Fleet Feet St. Louis locations. "This is an exceptional program run by people who are not only experts but who truly have a gift for coaching. I was amazed at how runners and run/walkers were encouraged and coached regardless of ability, experience, or pace." "I am always amazed at the positive energy this group generates." "Fleet Feet is the best all around running store and training program in the area. Great people and great support." "Tim & Brandi were amazing. THEY treated all the walkers just like everyone else and were always encouraging to me. This was my first event of this type EVER and they (and the Fleet Feet store) helped get me ready." "As in most programs, the coaches and the people make the program. And once again the coaches were amazing and the people I met were OVER The Top." 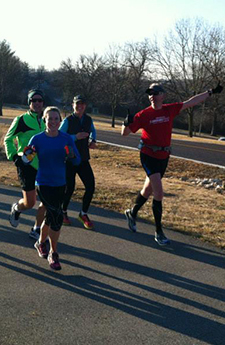 During winter/spring 2009, a film crew from KETC Channel 9 in St. Louis followed members of Fleet Feet's marathon training program as they prepared for and then ran the GO! St. Louis Marathon. Mother Nature regularly delivered forgettable weather to this particular group, but the participants' inspirational stories are ones you'll always remember. This documentary first aired on KETC on October, 21, 2009. Click here to learn more about Mike Burke and his motivational message.